K-guesthouse Dongdaemun 1 i Seoul, Sydkorea: Reservér nu! 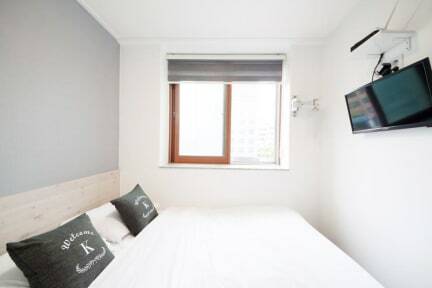 K-guesthouse Dongdaemun1 offers many facilities to enrich your stay in Seoul. Newly renovated and opened in 2015, this modern hotel provides chic air-conditioned rooms with ensuite bathroom and free Wi-Fi. Each room is fitted with a flat-screen TV and mini-refrigerator. Private bathroom includes shower amenities, towels and a hairdryer. A free and simple breakfast, consisting of hot drinks and toast, is provided every morning. All rooms are tastefully furnished and provide many services such comforts as non-smoking rooms, air conditioning (include heating). Besides, the hotel's all staff of recreational offerings ensures you have plenty to do during your stay. Guests can check e-mails and print documents at the lounge. 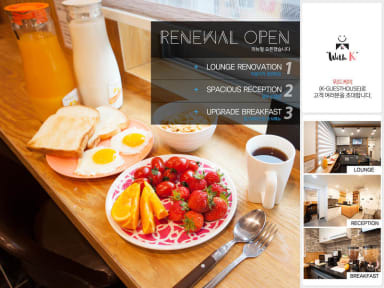 With an ideal location and facilities to match, K-guesthouse Dongdaemun1 hits the spot in many ways.